When you talk about golf at the Jersey Shore, three courses stand out in my mind for their unique and distinctive personalities. One of them is public, Twisted Dune, which I was drawn to from the first time I played it, soon after it opened in 2001. It’s so different, even from other sandy, shore courses; Twisted Dune looks like it was carved out of moonscape, or sandscape. (Bausch Collection photos). The other two are quite private: Galloway National GC, in Galloway, a 1995 design by Tom Fazio, known for his big-budget, big-canvas courses, which design aficionados tend to either love or hate. 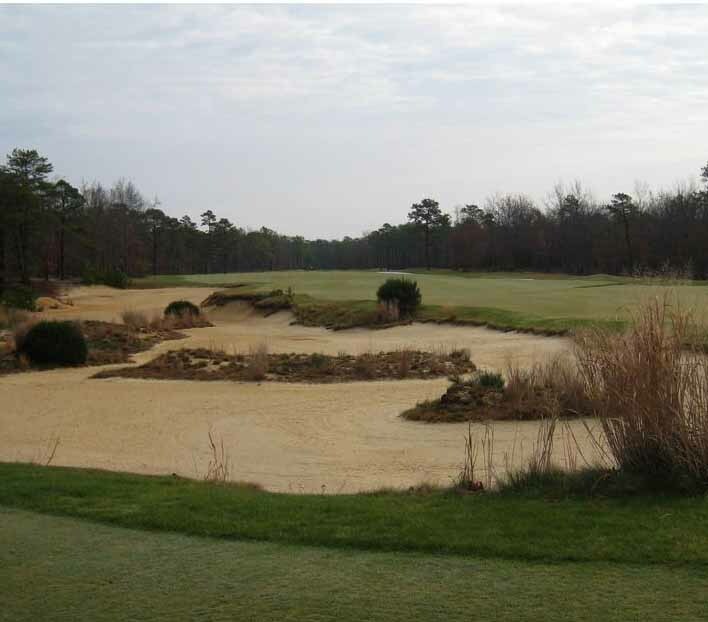 The third is Hidden Creek GC, in Egg Harbor Township, a 2002 collaboration by the darling duo of course design, Bill Coore & Ben Crenshaw, heralded as the masters of minimalism and golfing purity. To me, Twisted Dune (Bausch Collection) and Galloway National have a similar feel -- raw and brash, and they both constantly dare you to make a mistake. At either place, a good round can go wrong in a hurry. Hidden Creek feels different. (Bausch Collection) Although Coore & Crenshaw have given it some of the most visually arresting bunkering you’ll see anywhere, Hidden Creek is an altogether smoother, gentler ride. At no time does it gut-punch you the way Twisted Dune and Galloway National can. That doesn’t mean easy. From the Championship tees, Hidden Creek plays 7,023 yards, par 71, with rating/slope of 73.5/136, which is testy but not brutal; of course, for most golfers, Hidden Creek is plenty from the member tees, which play 6,562 yards and 71.6/131. (Scorecard). For the eighth straight year, it has made Golfweek’s list of America’s Top 100 Modern Courses, this year ranking 82nd. Hidden Creek’s 750-acre property boasts some surprising elevations for being in the middle of the Pine Barrens. It also boasts fairways are generous to a fault and green complexes that are enormous, with all kinds of swales and troughs and subtleties that can only be learned over time. It was clear when it opened at the height of the golf boom in ’02 that Hidden Creek was not going to be just another mid-level entrant in the private club scene. Conceived and developed by Roger Hansen, president of Ole Hansen and Sons, the idea was to create a high-end, golf-only club, to be filled out by locals and national and Philadelphia-area members who had vacation homes at the Jersey Shore. As a member of Pine Valley, the ultimate in such clubs, Hansen had all the inspiration he needed. Because Hidden Creek is so secluded, several years ago Hansen even added a comfortable Lodge to accommodate out-of-town guests. These days, with the economy in the tank, people who can afford one golf club membership, let alone a second at an upscale club like Hidden Creek, are at a premium. But if a recent round at Hidden Creek is any indication, they are hardly cutting back on the service, amenities or the expense to keep the course in top condition. Hidden Creek opens with the closest thing to a cream-puff par you are going find on the course -- a 392-yard wide-open, slightly uphill, slight dogleg left, with a mid-iron into the green into a large, open green. If you struggle here, it doesn’t bode well for the rest of your round. After the 2nd, a 374-yard par 4 with terrific fairway bunkering, and the reachable par 5 3rd, with more impressive fairway bunkering (here) and (here), you come to the 202-yard 4th, the first par 3 of the course. With its elevated tee, huge bailout area short of the green, and large, sloped green that runs away from you, it is the most visually arresting shot so far in the round, not to mention trickiest tee shot. No hole typifies the overall look and feel of Hidden Creek any more than two mid-length par 4s, the 381-yard 5th and the 426-yard 6th. Here and here you can see the open fairway of the 5th, and the visually deceptive fairway mounding, and a green that is virtually unprotected by bunkers. The 6th is another good example of how Coore & Crenshaw use bunkers to frame what could otherwise be a featureless hole. Thanks to an eagle, my new favorite hole on the front nine is the short (273-yard) par 4 8th, which is drive-able even by the likes of me. From the tee, you’re looking at a slightly uphill fairway with a pot bunker front and center. But if you can fly that that bunker and the crest, on the other side is a downhill slope that feeds your ball all the way to a large undulated, green as it did mine, leaving me a 15-foot eagle putt. After 10th a slight dogleg left with yet another bunkerless green, you reach the 11th, perhaps the toughest par 3 at Hidden Creek. Short at only 117 yards, it is nonetheless uphill with front bunkers, another menacing bunker to the right, and a nasty false front, and a slippery green. The 450-yard 12th is the No. 1 handicap hole at Hidden Creek, likely because it is unreachable in regulation by higher handicap players, not because it is overly difficult (here) and (here). The 374-yard 13th is as gentle as it gets, unless you manage to get in a greenside bunker. The 182-yard 14th is the last of the par 3s (and the least interesting), if you ask me. On a course that isn’t known for doglegs, the 391-yard 15th stands out, because it turns not once, but twice, making an accurate tee shot essential for the best angle and clear shot into the green. The two finishing holes offer a birdie opportunity at the reachable 488-yard par 5 17th, where the defense is yet more fairway bunkers and an green complex that is less benign than it appears. If I have a beef about Hidden Creek, it is that I think the par 5 9th would provide from drama as a finishing hole than does the 18th, a 402-yard par 4 18th that has neither the visual appeal or the oomph. All in all, however, Hidden Creek is a delight from start to finish. It impressive what Coore & Crenshaw have done, primarily with eye-catching fairway bunkering and spare, yet masterful, green complexes, and with little or no water. It should also be noted that Bausch Collection photos were shot late fall or winter, when the trees were not full and green, nor where the was the fescue as tall and penal as it normally is. In the warmer months, the course looks more alive and daunting. Hidden Creek is as good as it gets at the Jersey Shore. Very good review. I couldn’t agree more. I’ve played Hidden Creek several times and return every chance I get. Where’s the creek? Not only is HC the most interesting course at the shore. the club house is excellent and is not a monument to excess.